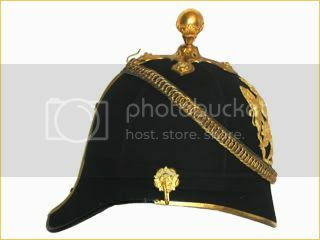 This pattern of Lancer helmet was introduced in 1856 as the other ranks pattern lance cap. 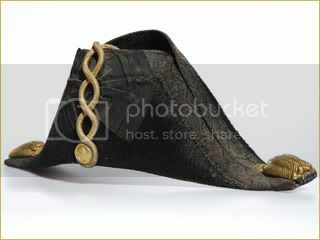 It was made of a black leather body, the top having cloth sides while the top was black patent leather. 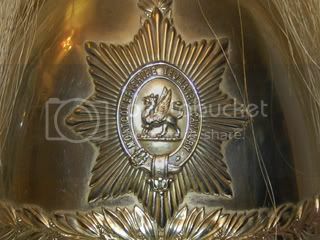 The triangular sunray plate features the Royal arms and regimental honours stamped out in brass, while the plume was red horsehair. 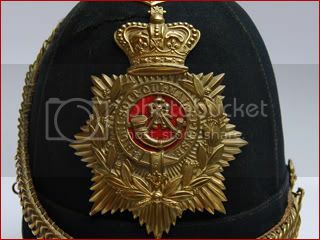 This example is that of an NCO's lancer cap of the 12th Royal Lancers (Prince of Wales's) Regiment, which was amalgamated with the 9th Queen's Royal Lancers to form the 9th/12th Royal Lancers (Prince of Wales's) in 1960. 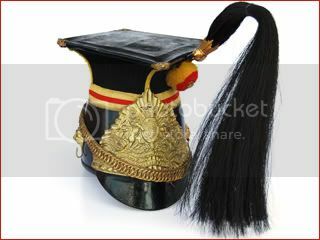 This example of an Other Ranks Lancer Cap is of the 16th (The Queen's) Lancer Regiment, with the plume of black horsehair. Made of brass, at the top there is a crosspiece base and a plume socket four-inches tall. This style of helmet was introduced in 1871 and used through the First World War. This example is of the 3rd (Prince of Wales's) Regiment of Dragoon Guards. This regiment was first raised in 1685. It saw service for three centuries, before being amalgamated into the 3rd/6th Dragoon Guards in 1922. This example is of the 5th (the Princess Charlotte of Wales's) Regiment of Dragoon Guards. In 1922 the Regiment was amalgamated with The Inniskillings (6th Dragoons), to form 5th/6th Dragoons. Based on the Dragoon style helmet, but in silver rather than brass, this pattern was introduced in 1871 and used through the First World War. The Montgomeryshire Yeomanry first formed in 1813 during fears of an invasion by France. One regiment of Yeomanry was formed during the Boer War and three regiments were formed during the First World War. Introduced in May 1878 the regulation Home Pattern Helmet, or Home Service Helmet, was made of cork covered in blue cloth, with two seams on each side. 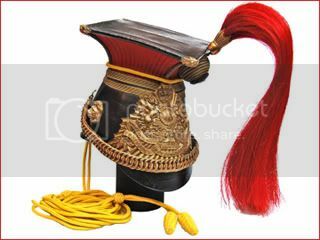 The chinstrap was made of interlocking brass rings backed with leather and attached to the helmet on two side rosettes, and when not worn (as shown in the photograph) attached to a rear hook. 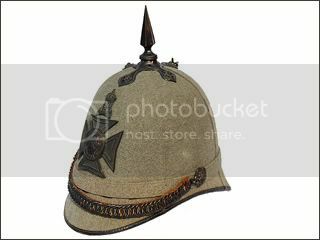 The 3 1/2 inch spike and base was fitted on the top of the helmet, ornamented with a rossette in the center and rosettes at the end of the cross plate. These helmets had a plate that featured an eight-point star, surmounted by a crown. In the center was the Garter belt with the motto Honi soit qui mal y pense decorated with a spray of laurels. Below the Garter was the silver scroll with regimental title. 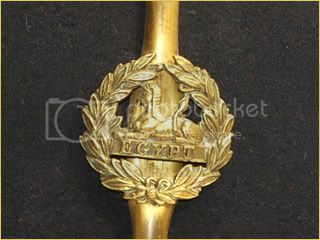 This example features the 1881 pattern badge of The Northamptonshire Regiment. In silver, on a black-velvet ground, the Castle and Key; on a scroll above reads Gibraltar and on a scroll below, Talavera. 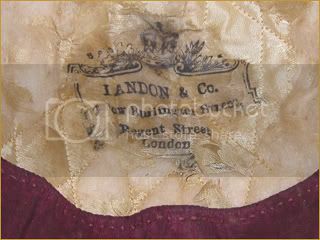 This helmet features the retail label of by Landon Co of Regent St, London. 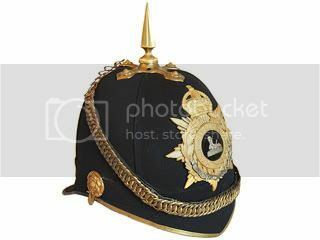 This Home Service Helmet features the 1881 pattern badge of the The Oxfordshire Light Infantry. This Other Ranks pattern helmet features a more simple design than the private purchase officer's helmets, but still maintains the basic shape. The front is more rounded than pointed, and lacks the brass trim. This example features the 1881 pattern front badge with the Imperial Crown. The regiment was formed as a consequence of Childers reforms of the armed forces, a continuation of the Cardwell reforms, by the amalgamation of the 43rd (Monmouthshire) Regiment of Foot (Light Infantry) and the 52nd (Oxfordshire) Regiment of Foot (Light Infantry), forming the 1st and 2nd Battalions, The Oxfordshire Light Infantry on 1 July 1881. 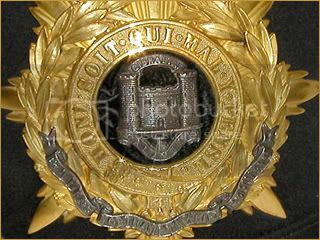 In 1908 the regiment's title was altered to become the Oxfordshire and Buckinghamshire Light Infantry, commonly shortened to the 'Ox and Bucks'. This helmet was made by Hobson & Sons of London. 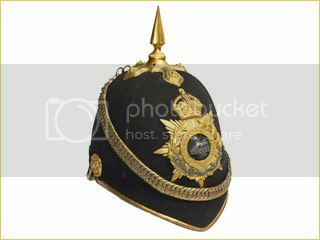 This Home Service Helmet features the 1881 pattern badge of the East Lancshire Regiment with the King's Crown. 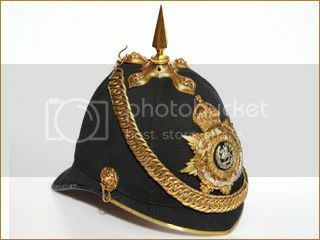 Below the Sphnix is not the traditional "Egypt" suggesting that this example was worn by a territorial of the regiment, likely raised in 1907 or 1908. 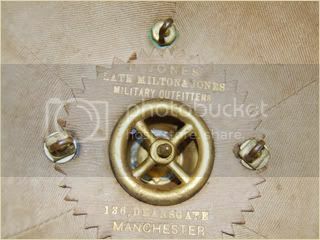 This helmet was made by D Jones Military Outfitters of Manchester. 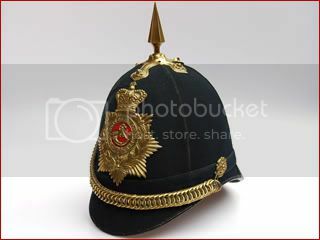 This Home Service Helmet features the 1881 pattern badge of the South Wales Borderers with the post-1901 King's Crown. The badge features the Welsh Dragon in the center. The Regiment was made famous for its exploits in the Zulu War in 1879. This example was made by Bartels Military Outfitters. 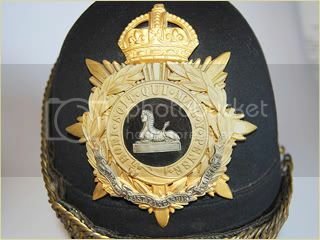 This Home Service Helmet features the 1881 pattern badge of the Gloucestershire Regiment with the King's Crown. The regiment was formed in Portsmouth in 1694 by Colonel John Gibson, and was named the 28th Regiment of Foot in 1751. And renamed in 1782 as the 28th (North Gloucestershire) Regiment of Foot. After the Childers reforms, the regiment amalgamated with the 61st (South Gloucestershire) Regiment of Foot to form the two-battalion Gloucestershire Regiment on 1 July 1881. Nicknamed "The Glorious Glosters", the regiment carried more battle honours on their colours than any other British Army line regiment. For their conduct at the Battle of Alexandria in 1801 the 28th were given the unique honour of wearing a badge on both the front and rear of their head dress. This Home Service Helmet features the correct "Back Badge" on the helmet. This helmet features the Hawkes & Co. (Piccadilly, London) Cork Patent stamp. 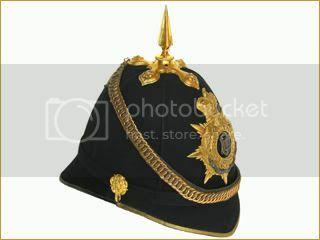 A Home Service Helmet of the Royal Field and Garrison Artillery, which adopted the helmet pattern in 1878. 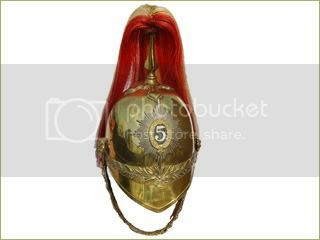 These helmets featured the a ball on top in place of the infantry spike, as well as a helmet plate in gilt brass with the design of the Royal Arms with the gun below. Above the gun in a scroll is the word Ubique and below the gun on another scroll the words Quo Fas et Gloria ducunt. The plate measured 3 7/8-inches high and 3-inches across. This maker of this particular example is unknown, but it was owned by an "H.C. Taylor." Volunteer Rifle Regiments used the 1878 Pattern Home Service Helmet, covered in gray cloth with two seams at eash site. At the back and front are peaks covered in gray cloth and bound round the bottom edge in leather. The hardware is blackened brass. 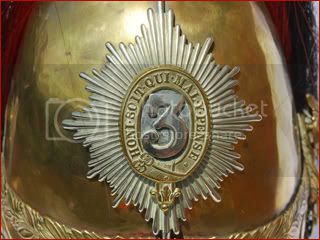 The helmet plate is in the shape of a Maltese Cross surmonuted by a crown. 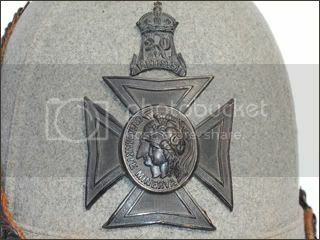 In the cross was a circle with the the unit's badge, designed by William Wyon, which shows the heads of the Roman gods Mars and Minerva in profile. The Artists' Rifles formed in 1859, part of the widespread volunteer movement which developed in the face of potential French invasion after Felice Orsini's attack on Napoleon III was linked to Britain. The group was organised in London by Edward Sterling, an art student, and comprised various professional painters, musicians, actors, architects and others involved in creative endeavours. It was established on 28 February 1860 as the 38th Middlesex (Artists') Rifle Volunteer Corps, with headquarters at Burlington House. Its first commanders were the painters Henry Wyndham Phillips and Frederic Leighton. 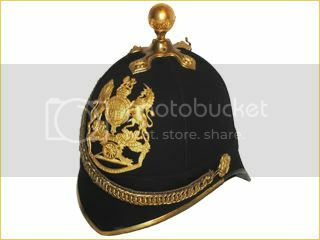 A bicorne hat for British naval officer, circa the interwar period. While widely worn as part of the full dress of officers of most world navies, this type of famous headgear has ceased to be worn. The origin of the feather bonnet go back to the 18th century, when the first patterns were knitted Tam o'shanter bonnet with a chequered border. This was propped up and worn with a tall hackle. 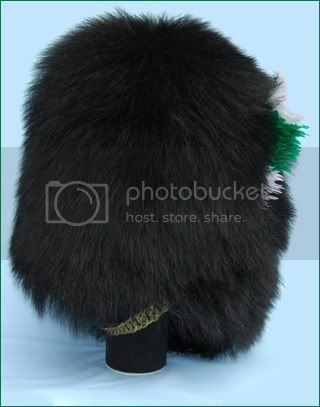 At the same time many highlanders began to add ostrich feathers to decorate it. This decoration evolved into a full covering of the original Tam o'shanter. The ostrich feathers were then entwined into a lightweight cage, producing the height. 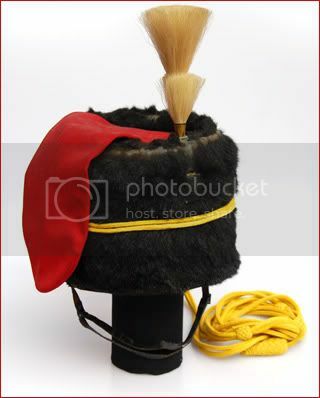 This example is a modern version worn by bandsman, and features the badge of the Argyall and Sutherland Highland Regiment - the unit known as "The Thin Red Line" for their service in the Crimean War. 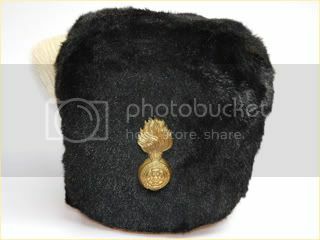 The Royal Fusiliers wore a tall racoon skin cap, sometimes called a "busby," but it is a cap larger than a busby yet smaller than the guard's bearskin cap. 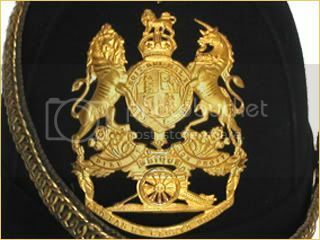 The regiments of the Royal Horse Artillery (RHA), dating from 1793, are part of the Royal Regiment of Artillery (commonly termed Royal Artillery) of the British Army. 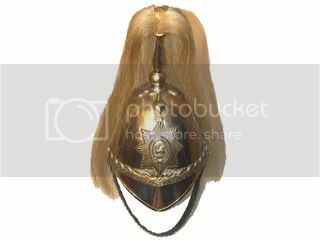 The Busby headdress is the English name for the Hungarian pr�mes cs�k� or kucsma, a military head-dress made of fur, worn by Hungarian hussars. In Great Britain hussar and RHA busbies are cylindrical in shape, with a bag. 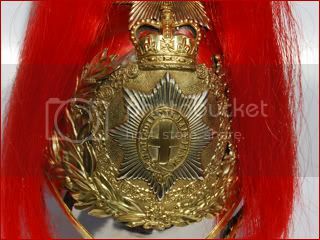 The RHA wore these with the cords tied around the busby and with just the white plume at the front and lacking any other badge. 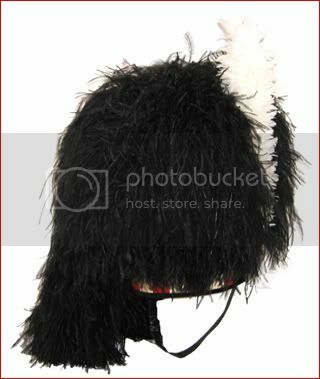 All five of the British Guard Regiments (Coldstream, Scots, Grenadier, Irish and Welsh) wear the bearskin cap. 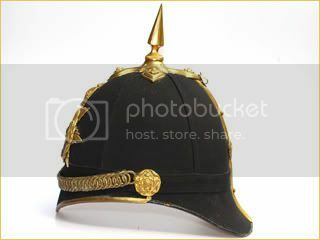 This began after the Battle of Waterloo, where the Grendadier Guards took part and played a role in turning Napoleon's Imperial Guard - who also worn bearskin caps. This tradition was extended to the other two regiments at the time, and with the formation of the later Irish and Welsh Guards to those units as well. 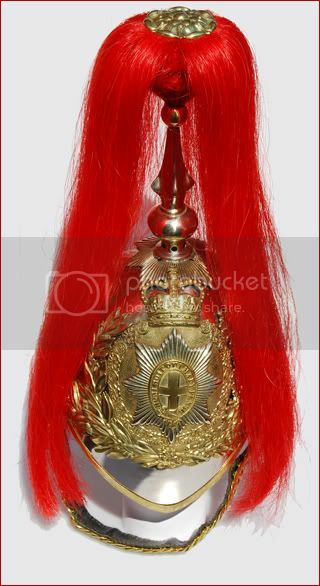 This example is from the Welsh Guards, and features the White/Green/White hackle with the colors of Wales on the left hand side. 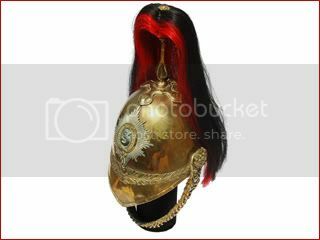 An other ranks cavalry helmet from the British Blue & Royals (Royal Horse Guards and First Dragoons). 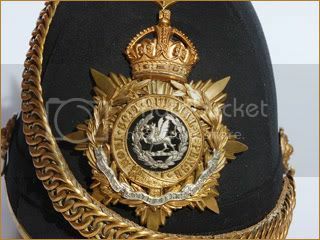 This is a post-1969 era helmet, when the regiment was formed in 1969 from the merger of The Royal Horse Guards, which was known as "The Blues" or "The Oxford Blues", and The Royal Dragoons, which was known as "The Royals." 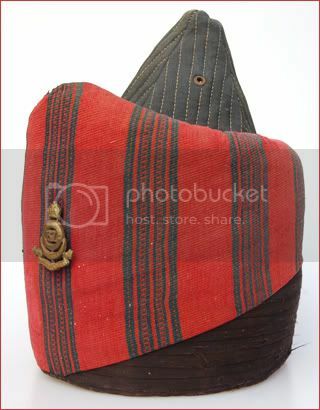 A First World War era Indian Army kullah - the traditional headgear of some Indian regiments. This one features the badge of the 67th Punjab Regiment, which served in Mesopotamia during the war.